With just a few added ingredients, transform the humble potato into a family-favourite side dish. 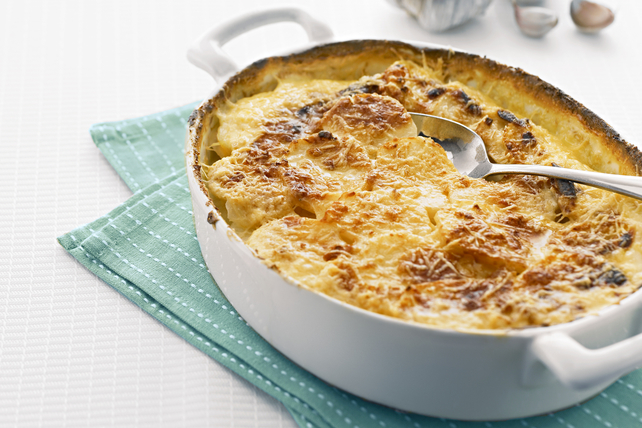 This scalloped potato recipe features creamy and garlicky goodness. Whisk cream cheese product, milk and pepper until blended. Layer half each of the potatoes, cream cheese mixture and Parmesan in shallow 2-L casserole dish sprayed with cooking spray. Repeat layers; cover. Bake 1 hour 15 min. or until potatoes are tender and sauce is hot and bubbly, uncovering after 45 min. Cut 4 green onions into thin slices. Reserve 2 Tbsp. ; toss potatoes with remaining onions before layering in casserole dish as directed. Sprinkle remaining on top for garnish. Prepare using Philadelphia Herb & Garlic Cream Cheese Product or Philadelphia Chive & Onion Cream Cheese Product. Or, use plain Philadelphia Cream Cheese Product, and whisk in minced fresh or roasted garlic to taste along with the milk and pepper. Serve with grilled steak or pork chops.